Many of our foreign-trained LLM students are preparing for careers at global corporations or law firms where knowledge of the US legal system is relevant and beneficial. This solid grounding in US law can serve as a significant differentiator for students upon return to their home countries. Emory Law is a top-ranked US law school, offering a world-class faculty, a diverse student body, a sophisticated and dynamic urban setting, practical opportunities to apply legal theory and skills, and a global alumni network. With abundant academic and community resources, Emory Law offers an ideal environment for personal and professional growth. Emory enrolls new LLM students in August and in January. Students typically complete their degree in two semesters. Apply by November 15 to start in January or June 30 to start in August. LLM students choose from two broad tracks, including a traditional LLM in general studies or one of six formal concentrations developed by the Emory Law faculty. 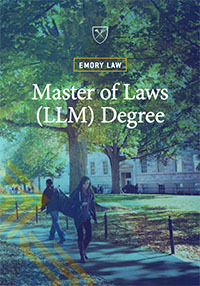 All graduates of the LLM program at Emory receive a diploma for a Master of Laws degree, regardless of concentration. Emory Law’s LLM program typically includes students coming from China, Colombia, Costa Rica, Georgia, Germany, Guinea, India, Iran, Japan, Kazakhstan, Nigeria, Saudi Arabia, South Korea, Switzerland, Taiwan, Thailand, USA, and Venezuela. Join the LLM Society student organization or one of nearly 40 other student organizations at Emory Law. LLM students are supported by the Graduate Programs Office, dedicated to providing individualized service to help students succeed at Emory.